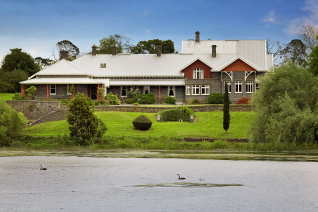 The 10-bedroom house sits on a 170ha property with 2km frontage to Lake Purrumbete which the current owners use as a reception centre. The Great Hall is regarded as one of Australia’s finest art nouveau interiors and features 6 murals by Heidelberg School painter Walter Withers. The murals tell the story of how the Manifolds settled the area. The house also features carvings by Robert Prenzel. The historic outbuildings include two cottages, a coach house, blacksmith’s shop, stables and bluestone shearers’ quarters.